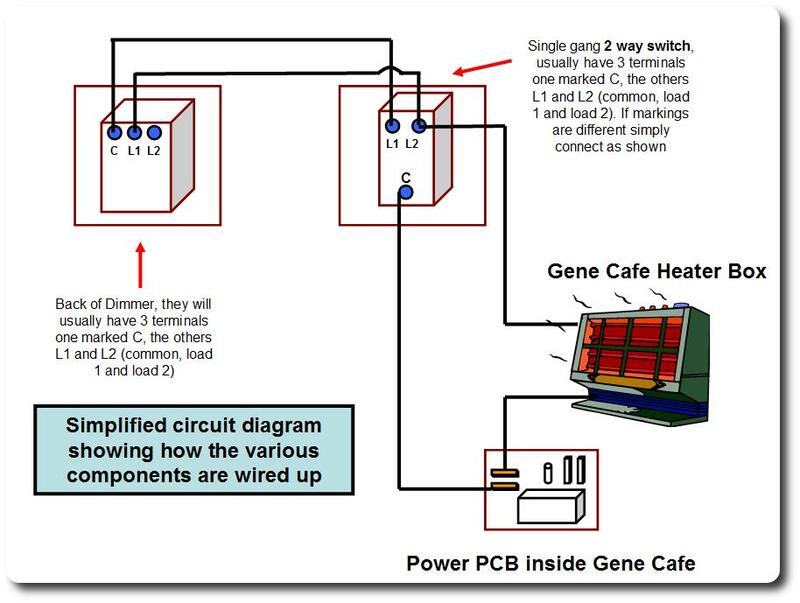 Enable the Gene to progressively lower the power applied to the heating element, so that rather than switching it on and off, it simply got less hot, minimising the temperature gradient within the drum and the overall maximum temperatures the beans are subjected to near the inlet end of the roasting chamber. overall temperatures within the Gene would be reduced extending component life and heating element life, because maximum temperatures are reduced overall. If you do have a pre March 07 Gene with a 230V element, you will probably get better (and faster) roasts and prolong heating element life. Single pole 2 way light switch 10 amp rating (£1.19 Wickes)..I was cheap and bought a 6 amp switch, but wish I had bought a 10 amp. Piece of Aluminium sheeting 0.5-1mm thick, 150-180 mm long and approx 40mm wide. You should be able to scrounge an off cut for a few pence, or grab a piece at a local scrap dealer or municipal dump. Add some extra heat sink capability. 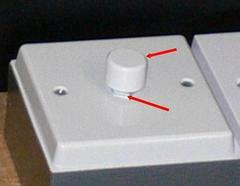 First pull off the knob and undo the nut as shown by the arrows. This will allow you to remove the dimmer module and it’s heat sink. You want to end up with something that looks like the diagram below. The piece of Aluminium simply has a hole drilled out (elongated hole is better) and is bent as shown below. The hole is large enough for the threaded part of the dimmer module (the part the but screwed on to earlier) to be passed through it and the replaced and re-tightened. As long as your piece of Aluminium is flat and not too thick. 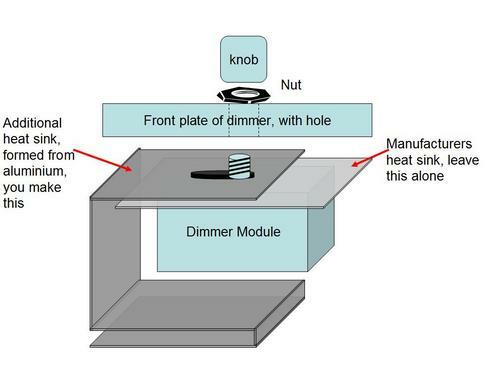 The existing heat sink of the dimmer is in full contact with it and when the module is replaced sufficient pressure is applied to form an excellent thermal contact area. You will actually be able to use a heat sink much smaller than mine e.g. omit the folding back on itself….me I just like IKB type design. 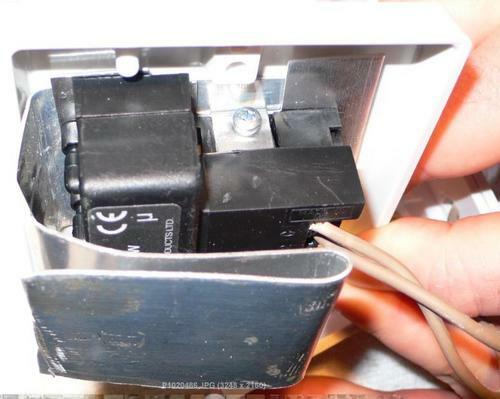 Your dimmer should look something like this…Congratulations, your dimmer will now easily handle the 1250+ watts of the heating element with no problems or further modification required. I should add though that it is extremely important to have a good contact between the extra heat sink and the existing heat sink of the dimmer and ideally, use thermal past at the junction of the two heat sinks. Use a drill with a HSS (High Speed Steel) bit to drill holes in the pattress boxes, one for the cable from the gene, and then 2 holes that line up between the boxes for the dimmer wires. To finish off the wiring in the pattress boxes, simply finish wiring the dimmer to the 2 way switch as shown below (click to enlarge). After some time using this modification, I have decided to drill some extra ventilation holes in the rear of the pattress box, using the existing push out points. and don’t forget to add cable ties inside/outside of holes to prevent wires pulling/being pushed through (click to enlarge). Just to ensure it's clear exactly how things were wired a very simple schematic of the circuit (click to enlarge). I start my roasts with the Gene set to 240C and the switch in the DIR position, so that the dimmer is not being used and for at least the first 5 minutes and possibly up to 1st crack, I won’t be using the dimmer module. 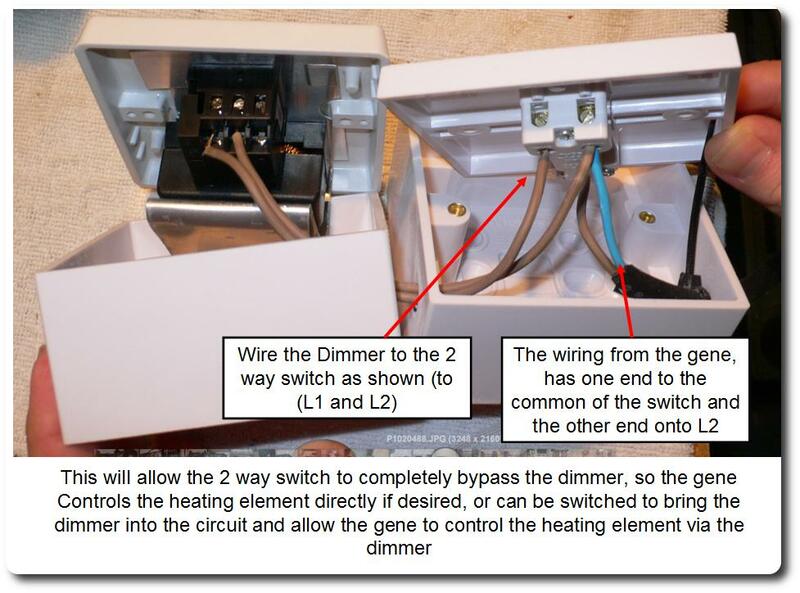 As soon as I want to control the temperature or slow the ramp, I switch to DIM and start using the dimmer (which I leave initially in the fully bright position). 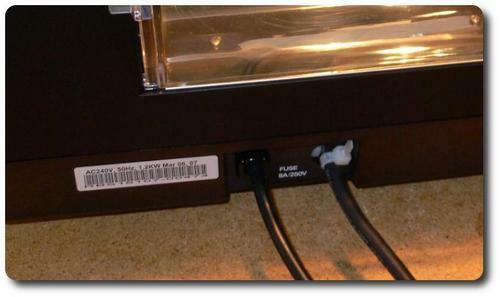 I find that depending on the ambient temperature and the temperature I want to maintain my roast at….around 1050 to 1100 watts in winter (possibly 1000W in summer), is enough to maintain the temperature without the element switching on and off. My Gene temperature control knob is now simply a safety or limiter on the maximum temperature the roast can achieve. Note: don’t set the genes own temperature control too close to the desired temperature as if the Gene reaches it, it will switch off the element and drop nearly 3/4C, something we want to avoid (This is why I use 240C). 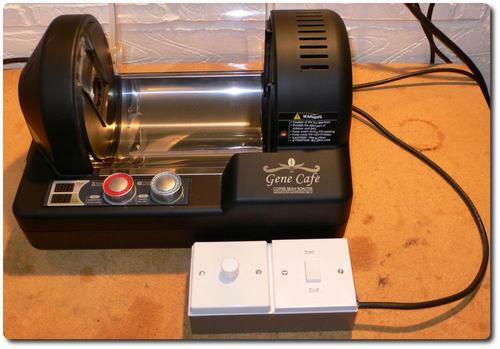 So if your voltage is good, you can control part of the ramp up and certainly have a controlled drying stage if you want to….for beans which are reaching 1st a little rapidly again you can temper this. At and beyond 1st crack you can pretty much set whatever profile you desire. 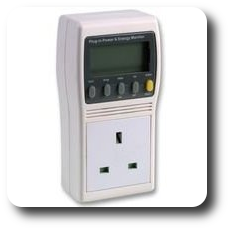 The temperature gradient within the drum when under dimmer control will be at the absolute minimum it can be. Initial results are very encouraging, roast quality is great, roasts are visually more even, especially on beans which tend to be a little uneven anyway. Careful inspection will show a significant reduction (or absence) of Divots, Tipping or scorching. Interestingly roasts can actually be heard entering second crack, but the bean does not seem as dark as it would usually be when this happens, indicating the possibility or a more even roast throughout the internal structure of the bean. Thanks to Martin (Mole) for working with me on this project and providing the additional help needed to achieve a successful solution. 1. This can be obtained for around 5-8 with around 100 crimp spade connectors. 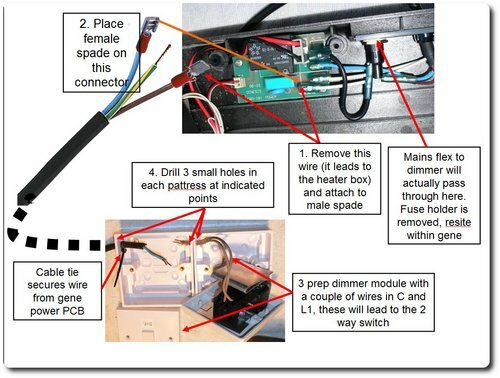 Alernatively take the lead to your local electrical repairers and ask them to pus a male and female spade connector on for you for a few pence. You can optionally add soldier to these connectors as well. Ebay would be a good source of a cheap crimper and crimps or of course Maplin. 3. I checked with Varilight’s technical department and based on the information supplied am personally happy that the modifications should result in a solution that is fit for our purpose. 4. When reassembling the Gene Outer shell, it should fit perfectly. 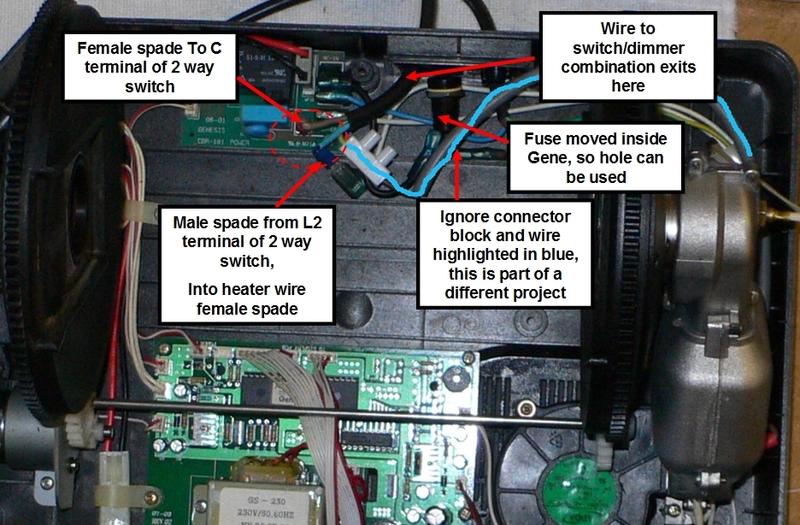 If for any reason it doesn't or you can feel some flexing where it's not meeting correctly all round, check the routing of the new wiring you have put in and the placement of the fuse. Everything on the Gene fit's really well, if it doesn't, then there is a problem that needs sorting before the case goes together.